Chick Invitations is the newest member of Soiree Philadelphia! They say birds of a feather flock together, right? Well, at Chick Invitations our feather is a common love of exquisite paper, meticulous details and great design. Founders, Ashley Macri and Robyn Platoni met while attending design school in Philadelphia. The duo became great friends and began designing custom invitations when it came time for Ashley’s own wedding. Word spread to family and friends and soon, Chick Invitations was formed to keep up the demands of their growing business. Years later, Chick has grown from wedding invitations to a full service invitation design studio, prepared to add your style to every aspect of your event. Welcome again to Chick Invitations! Thrilled to have you as a part of our collective! Well-structured timelines are one of the most important aspects of not only your wedding day, but also the wedding planning process as well. When should you hire your photographer? When should you have your final fitting? And, when exactly should you schedule that all-important cake tasting! Nothing can make your special day become decidedly unspecial than if your musician doesn’t show up on time, or those personalized napkins you ordered aren’t being passed with your hors d’oeuvres at cocktail hour! Little Woman Design takes timelines very seriously! During our initial consultation with a couple, we will work through a checklist of stationery that a couple wants, and then start developing a timeline based on the number of custom designs needed and the quantity of items desired. While it’s great to dream of having a wedding theme that carries through your entire wedding, you may not be able to realize your dream if you wait until the month before your wedding! We have outlined a sample timeline that a couple can jump into from both a 12-month mark and a 6-month mark. While we certainly do not want to discourage couples who have less than 6 months until their wedding day, we want to offer a realistic approach to planning your custom designed wedding stationery. 12-months/6-months: Interview and hire your wedding stationer/graphic designer. Do you like a certain illustration style that a particular designer has? Are you hoping to carry certain design elements throughout the entire wedding? It’s important to interview and hire your stationer/graphic designer early so that your designer can develop not only a comprehensive proposal to cover your stationery needs, but also a highly detailed timeline which allows you a chance to comment and request changes on proofs of work given to you. 6-12 months: Send out your save the date. While most books and advice columns will advise sending out save the dates only if you have many out-of-town-guests, we advocate for these items for other reasons as well. Are you getting married on a holiday or a holiday weekend? Or, are you getting married in the middle of the summer, when many people will book their vacations sometimes up to a year in advance? If so, you want to send out a save the date sooner rather than later! Outside of timing reasons, couples may consider sending out a save the date to either set the stage for what the theme of their wedding may be, or to depart from the formality of their wedding invitation suite, and do something fun and whimsical! 4-6 months: Design your wedding invitation set. Would you like letterpress or digital printing? Embossed or engraved? 100% recycled or 100% cotton (also eco-friendly) paper? There are so many options to choose from, and it would be best to start early so that you get exactly what you want in a wedding invitation. As an engaged couple, you should be able to let your designer know what you’d like, and let them present to you the best way in keeping with your budget to accomplish it. Let them show you swatch books of papers and review design concepts based upon your ideas. 4-5 months: Calligraphy. You’ve spent thousands of dollars on your fabulous, custom designed letterpess wedding invitations! You picked out a gorgeous pattern for your envelope liner! With all this in mind, should you really be addressing your invitation’s outer envelopes (unless you are a master at hand-lettering!). Wow your guests from the outset and book calligraphy services as well. Trust us, you will have your fill of addressing envelopes over the course of your wedding planning and celebration. Save yourself the time and hassle, and have a professional calligrapher do it! 2-8 weeks: Miscellaneous customizations. Whether you want custom designed seating cards, or hand lettered table numbers, you won’t be able to have them done until after you get your RSVPs as you will need to know both the names of the guests coming as well as the table number they will be sitting. Or, maybe you want tags for your wedding favors, a custom made footer for your photo booth picture, or your own personalized cocktail napkins. While the designs of these items should have been done weeks before the 3-8 week mark, you should be taking delivery of the majority of these items at least one or two weeks prior to the wedding day. Designing your wedding stationery will be one of the most rewarding and creative aspects of planning your wedding! Allow yourselves enough time for the designing process and you’ll be able to ensure that your vision comes to life! For more information about Little Woman Design or to request a free consultation, please visit our website at http://littlewomandesign.com/contact or email us at francesca@littlewomandesign.com. Little Woman Design is a full member of the Soiree Philadelphia collective. For more information on Soiree Philadelphia, please visit our Contact or About pages. 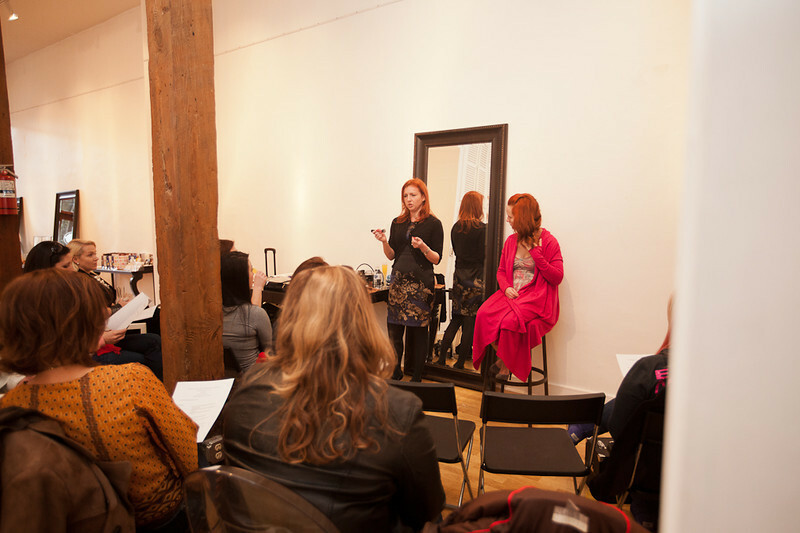 Soiree Philadelphia was delighted to host Aleksandra Ambrozy‘s first makeup class! It was such a success, she has already planned a follow up course & more classes in the coming months. Images courtesy of Mary Kate of Kate’s Lens Photography. One of the best parts of establishing this collective has been meeting such creative, artistic people! 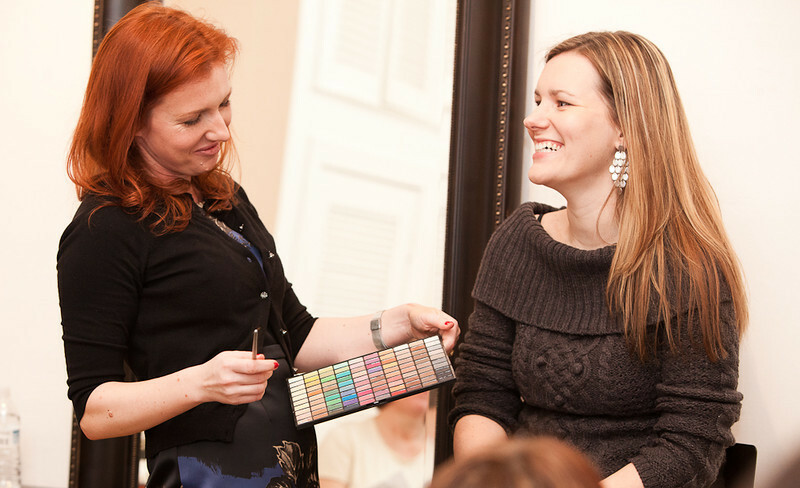 We are so thrilled to announce that Little Woman Designs has joined Soiree Philadelphia. As soon as I met Michael & Francesca, I knew they “got” what Soiree is all about – they are enthusiastic, passionate about their work and have such a love for weddings! The perfect fit for our growing group of professionals! They have lots of exciting plans for couples at the Soiree boutique – keep a look out for information on upcoming events!